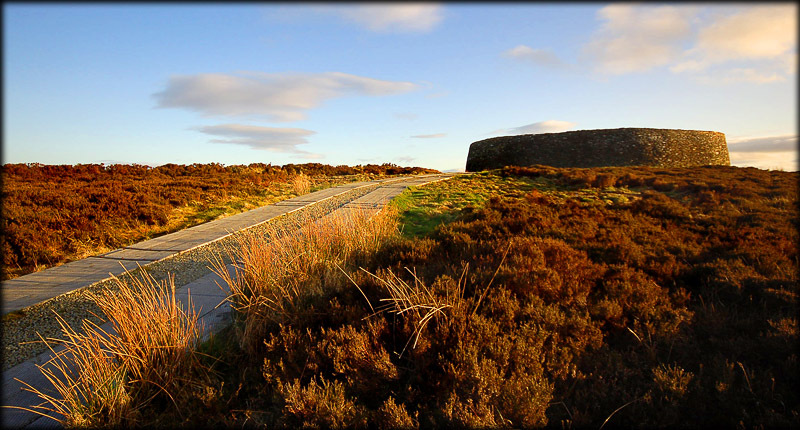 This restored cashel is over 23 metres in diameter with surrounding earthworks and sits atop Greenan Hill with 360 degree views across Lough Swilly, Lough Foyle and the gorgeous countryside of the Inishowen Peninsula. On a clear day it is believed that the view includes 5 counties. At 3.9 meters thick and 5 metres tall, the dry stone walls of the “Stone Palace of the Sun” have three interior walkways which are easily reached by several inset stairways. The stone fort is believed to have been built in the 1st century, on the site of an early Iron Age (c 500 BC) multivallate hillfort. The outline of the mostly-eroded ramparts, or earthen banks, can be seen below the fort. The hillfort is one of only 5 Irish sites marked on Ptolemy of Alexandria’s 2nd century map of the world. 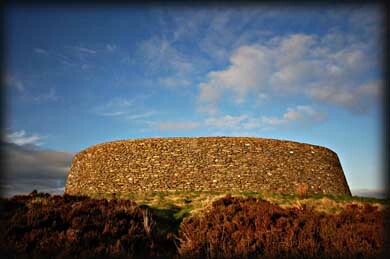 From the 5th to 12th Century AD it served as the royal seat of the Ui Neill, ruler of the Fifth of Ulster, which extended from Tyrone to Donegal and beyond Partly destroyed in 1101 by Murtagh O’Brien, then ruler of the Fifth of Munster, in retaliation for the Ui Neill’s destruction of his royal seat at Kincora. 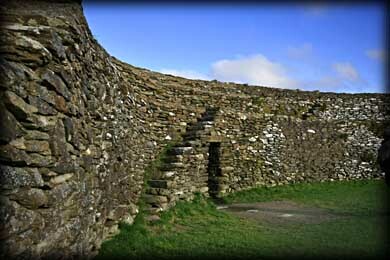 O’Brien reportedly ordered his soldiers to each take a stone from the fort so that Grianan would be reduced to a ruin. Grainan was restored between 1874 and 1879 by Dr. Walter Bernard, a Derry antiquarian. The fort was hugely over-restored by Dr. Bernard and recently more controversial restoration has taken place by the office of public works. Although I have visited the fort here on numerous occasions in the past, I was particularly thrilled with this visit to Grianan of Aileach, as it was such a beautiful evening and also Debs first visit. I had been ranting and raving about the spectacular views from here for weeks, so was delighted we managed to get great weather and wonderful light. 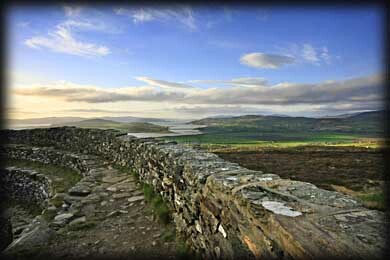 This monument, without question, offers some of the finest views in Ireland. Close by the Fort are the remains of a cairn and also a holy well. Situated: From Letterkenny head east towards Derry on the N13 after 5 kilometres turn left at the roundabout, staying on the N13 heading for Inishowen. Shortly after Newtown Cunningham you will see Burt Castle on your left. 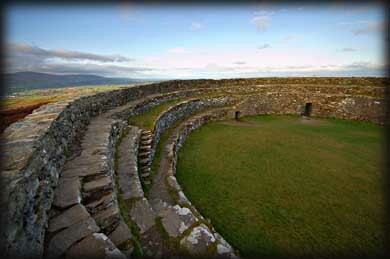 Look out for a right turn for Grianan of Aileach. The monument is well sign-posted from this turn. Discovery Map 7: C 3659 1974. Last visit April 2010.